Mr. Tiffin’s class is on a mission to see how many seeds are in three different sized pumpkins. They pull out all the seeds and count by twos, fives and tens to see which pumpkin has the most, and are surprised by what they discover. 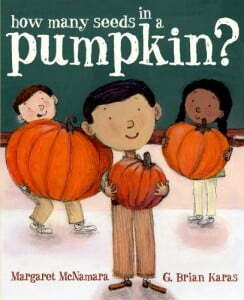 This book is a fun way to introduce kids to estimation; they too can count how many seeds are in a pumpkin!